O Most Holy Trinity, Father, Son and Holy Spirit, I adore Thee profoundly. I offer Thee the most precious Body, Blood, Soul and Divinity of Jesus Christ present in all the tabernacles of the world, in reparation for the outrages, sacrileges and indifferences by which He is offended. By the infinite merits of the Sacred Heart of Jesus and the Immaculate Heart of Mary, I beg the conversion of poor sinners. In 1935, Jesus Himself gave the first of a series of prayers of reparation to St. Faustina. These prayers, which can be prayed on rosary beads, make up the Chaplet of Divine Mercy. 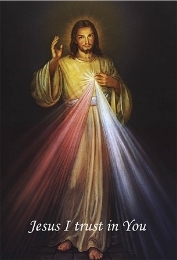 Learn more about the Chaplet of Divine Mercy, including how to pray it, here. Eternal Father, Your Son was sorrowful unto death during His agony in the Garden of Gethsemane, when the sin of the world pressed upon His innocent being until His sweat became blood. He endured the terror of human suffering, the tyranny of injustice and the horror of sin to redeem sinners. He revealed His mercy by suffering His Passion. We beg You to heal and bless the victims of priestly abuse who have shared a portion of the Passion of Jesus. You, O God, make all things new! We ask You to restore what was unjustly taken from the victims. We implore You to open the floodgates of mercy upon all victims for a renewal of their scarred memory, broken hearts, dishonored bodies, and inconsolable spirits. By Your loving grace, restore their lives. We entrust all victims to our Sorrowful Mother, who held her suffering Son in her maternal arms and cleansed His wounds. Eternal Father, the righteous blood of Your Son was not spared. For sinners He suffered unto death. We bring before You the priests who have hurt others by some form of abuse. All have sinned and fall short of the glory of God (Rom. 3:23), but when a beloved priest falls into sin and hurts a person entrusted to him, some goodness dies within the entire Body of Christ. Although the transgressions of some priests may be horrific and people may cry out for vengeance, we entrust them to Your fatherly providence. In Your mercy, minister to wayward priests who may be suffering deeply from the interior agony caused by their sins. We entrust fallen priests to the heart of our Sorrowful Mother. although innocent, are treated like outcasts and forsaken by many. When You look upon the priests who suffer false accusations, You see their resemblance to Jesus in His Passion. Your Son was wrongly accused and was stripped of everything until He hung naked on a cross as a victim of love. set apart like lepers, even though they are innocent of the charges against them. In Your mercy, graciously heal any wounds stemming from the experience of unfounded accusations — especially anger, depression, anxiety, loneliness, rejection, and fear. Help those priests to learn the value of coredemptive suffering so they may unite themselves to the perfect sacrifice of Jesus, the Lamb, and let them know the consolation of Your loving presence. In Your justice, restore the good names of those who are innocent, and bring justice where it is needed. We entrust all these priests to Mary, our Sorrowful Mother. Eternal Father, as Your beloved Son carried His Cross to Calvary to be crucified at the hands of sinners, He was covered with wounds, which became the means of our healing. The Church today suffers from the wounds of many scandals. The Body of Christ experiences the weight of scandal and persecution. We have corporately sinned against the greatest commandment of divine love. The Church is in great need of the salve of divine mercy in order to be healed. Graciously bring about a movement of medicinal reparation. Enkindle the hearts of the faithful to seek the healing balm of sacramental life. We trust that You will bring good out of the immense suffering of the Church as we humble ourselves before You. By the blood of the Lamb, cure our sin-sickness; take away our darkness, blindness, deafness, stubbornness, divisions, depression, sloth, vice, and pride. Restore our baptismal innocence that we may glorify You. Through the Eucharist, may the Divine Physician manifest His healing power! We entrust this petition to the heart of Mary, our Sorrowful Mother. Help the faithful to offer the generous gift of forgiveness from the heart. Aid the Church in applying the healing salve of mercy to the deep wounds inflicted by scandal and persecution. Heal the anger and frustration of Your people who are mystified by what has happened in the Church. Only by Your grace can we be reconciled to each another and forgive as Jesus does. Thank You for the many good servants who are working to heal those who suffer the scars of abuse. We implore You, O God, to transform the wounded and healed Church into a “civilization of love.” Cleanse Your house of prayer of all that is defiled and dead. Through the grace of forgiveness, make us healthy and holy. We entrust this petition to the heart of Mary, our Sorrowful Mother. Amen. This Scriptural Rosary originally appeared in Praying for Priests: A Mission for the New Evangelization (Sophia Institue Press, 2014) by Kathleen Beckman, L.H.S.